The Olmsted Falls Board of Education approved an updated five-year forecast at its regularly scheduled monthly meeting May 20th. School district’s in Ohio are required to file updated 5-year financial forecasts each year in October and May. Click here to review the latest 5-year forecast for the Olmsted Falls School District. 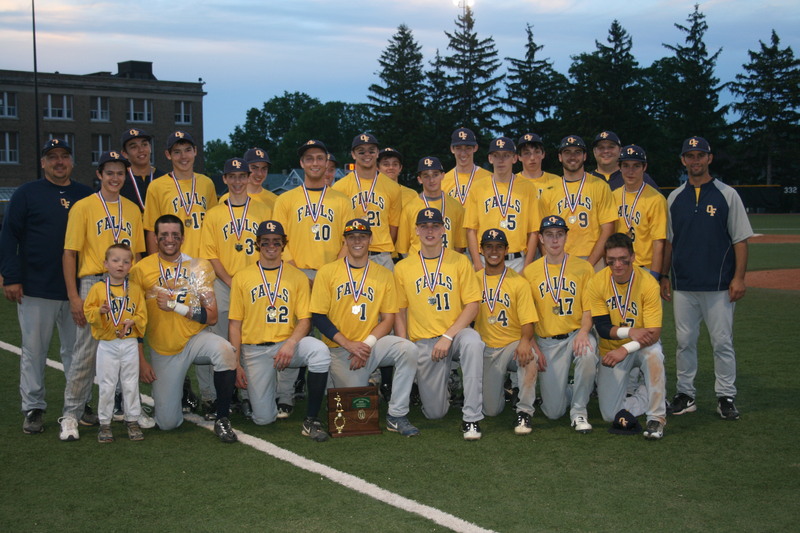 Congratulations to the OFHS Varsity Baseball Team on winning the school’s first-ever Division I District Baseball Title! Our Varsity Bulldogs upset the Wildcats of St. Ignatius last Thursday with a final score of 6-5 to earn the 2010 District Championship game. Next up for the Bulldogs is playing Strongsville High School in the “Sweet 16” this Thursday, May 27th at 5pm at Case Western Univeristy Baseball Field. Click here for directions. Tickets: Adults $6.00; Students $4.00. Thursday’s winner will play on Friday, May 28th at All-Pro Freight Stadium in Avon (home of the Lake Erie Crushers) for a shot at a trip to the State tournament in Coumbus. This is the first time OFHS has made the Regional tournament as a Division I school in baseball. GO BULLDOGS! For additional information, game coverage and highlights, visit www.ofbaseball.com. 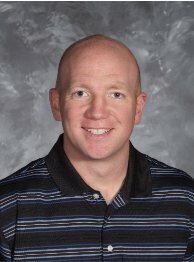 Longtime assistant basketball coach for the Olmsted Falls Basketball program, Chris Delisio, has been hired to replace the twenty–one year veteran head coach Pat Donahue. A 1995 graduate of Olmsted Falls High School, Delisio has been Donahue’s junior varsity and varsity assistant since 1999. A standout in his own right at Olmsted Falls, Delisio knows the success of the boys’ basketball program both as a player and as a coach. Delisio teaches ninth and tenth grade social studies at the high school, and is currently seeking residence with his wife and two children within the school district. Olmsted Falls High School senior Bruce Mikla won the opportunity to cover the Cleveland Indians game last Wednesday, May 19th, as part of the Tribe’s annual “Tribe Reporter for a Day” program. The “Tribe Reporter for a Day” program, co-sponsored by the Cleveland Indians and The Plain Dealer, is designed to provide area students aspiring to become sports journalists with an exciting inside look. Students (grades 9-12) competed in an essay contest on “Why they would like to be selected as a winner of the Tribe Reporter for a Day contest” for the chance to get an up-close and personal Tribe experience. 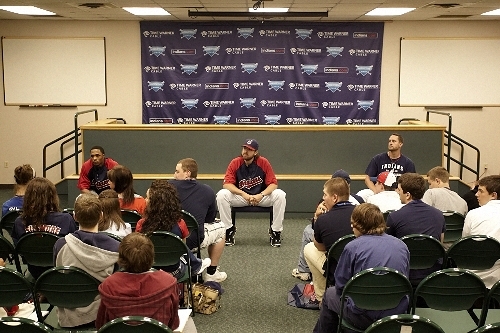 Prior to the Tribe’s game against Kansas City, Bruce was among a group of 25 students who had an opportunity to discuss the journalism industry with Paul Hoynes, an Indians reporter from The Plain Dealer, observe a press conference in the Progressive Field Press Interview Room, and interview Indians pitchers Mitch Talbot, Chris Perez and Tony Sipp (see photo below!). From this experience, contest winners each prepare a story of their experience for possible publication in The Plain Dealer Education Corner. 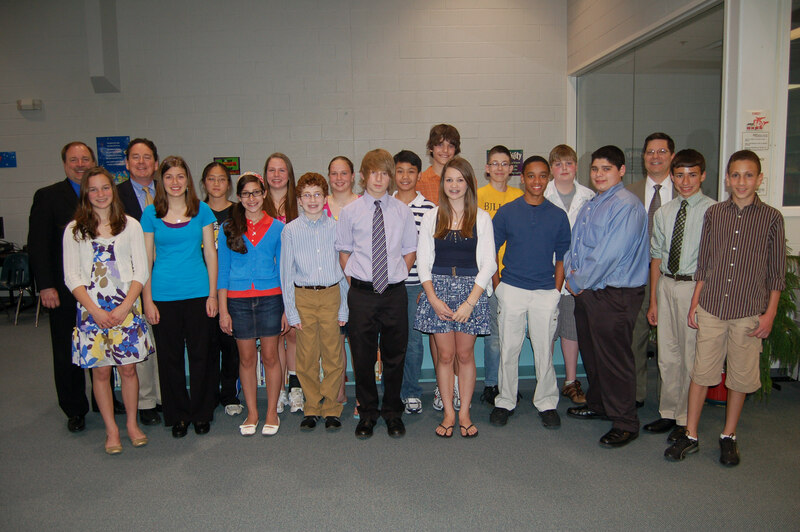 A capacity crowd of students and parents filled the Middle School Media Center last Thursday night (May 20th) as the Board of Education recognized Midwest Talent Search and Junior Core students during their regular monthly meeting. Regency Construction President Mrs. Tari Rivera (back, 2nd from right), and participants in the Regency Junior Core Project presented an overview of the innovative partnership to Board members before being honored at the May 20th Board of Education meeting. Board President Frank Pedicini (far right) and Vice President Joe Bertrand (far left) join Principal Kurz in honoring 20 Middle School students recognized in the Midwest Talent Search for their outstanding scores on the ACT and/or SAT tests. 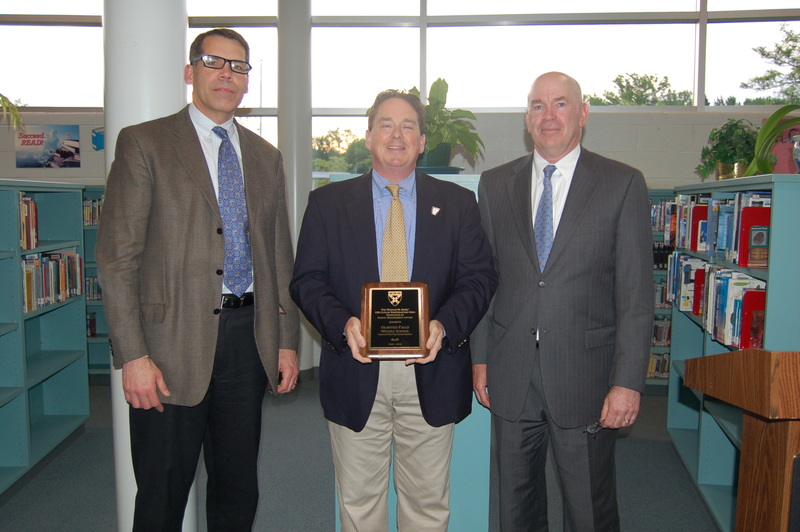 Harvard Business Club representatives Dan Carney (left), president of AT Carney Executive Searches, and Rex Mason (right), CEO of Root Candles, attend Olmsted Falls Board of Education meeting to present Principal Mark Kurz with 2009 William M. Jones Excellence in School Management Award. Olmsted Falls Middle School Principal Mark Kurz was awarded the 2009 William M. Jones Excellence in School Management Award by the Harvard Business Club of Northeast Ohio. Representatives from the HBC presented the prestigous award to Mr. Kurz at the May 20th Board of Education meeting. Along with the well-deserved recognition, Mr. Kurz also received a check in the amount of $3,000 for Olmsted Falls Middle School. ATTN: PARENTS. The Cuyahoga County Public Library’s Annual Summer Reading Game gets underway on June 5th and runs through August 7th. The theme of this year’s game is “Books Ahoy!” Olmsted Falls School District encourages participation in the Summer Reading Game by all students as a way to maintain and enhance important literacy skills over the summer months. All Olmsted Falls School District students in grades K to 8 will be automatically pre-registered to participate in this year’s program. Registration allows for participation in “Books Ahoy!” at any Cuyahoga County Library branch including Olmsted Falls, North Olmsted, Berea and Middleburg Heights. Watch for additional information. OFHS mathematics teachers Ms. Donna Langenderfer and Mr. Jeff VanArhem have created an informational letter for parents of incoming high school freshmen (and current 9th graders who may not have a calculator yet) to serve as a helpful guide in the required purchase of a graphing calculator. Click here for a copy of this letter. SAVE THE DATES! Two annual golf outings, sponsored by the Olmsted Chamber of Commerce and the Olmsted Falls Schools Endowment and Alumni Association, help raise funds for graduating seniors from Olmsted Falls High School; and the first-ever 5K through Olmsted Township benefits the Alzheimer’s Association. Click here for details on the 7th Annual Olmsted Chamber Golf Outing* on Thursday, June 3rd. Click here for details on the Fat Little 5K in Olmsted Twonship on Saturday, June 19th. Click here for details on the 2010 John Sanders Memorial Golf Outing* on Saturday, July 17th. * Proceeds from these golf outings benefit each respective organization’s scholarship program. More than 170 students and staff joined the innovative new club and ironed-on the official logo, designed by 5th grade student Amy Ondich, onto t-shirts. 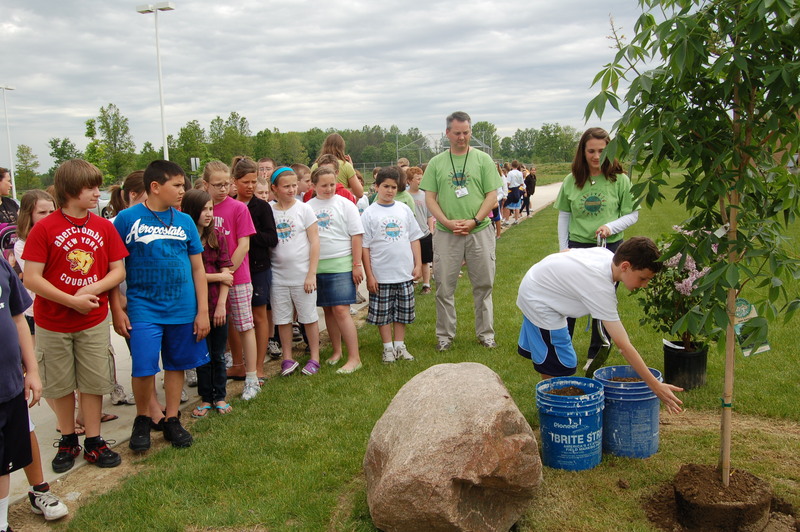 Students in Mr. Schafer’s and Mrs. Atkins’ classes launched the “Green Team” Club this spring, raising awareness and enough money for the purchase of a buckeye tree and three small bushes for the new Intermediate School. Combining curriculum concepts from science (ecosystems) and social studies (economics), the 5th grade students sold memberships throughout the entire building, as well as bracelets made from recycled products. More than 170 students and staff joined the innovative new club. All members were invited to attend the official tree planting ceremony held last Friday, May 21st. Fifth grader Michaela Baum wrote and read the official dedication speech, noting that the three smaller bushes represented the concepts of reduce, reuse and recycle. 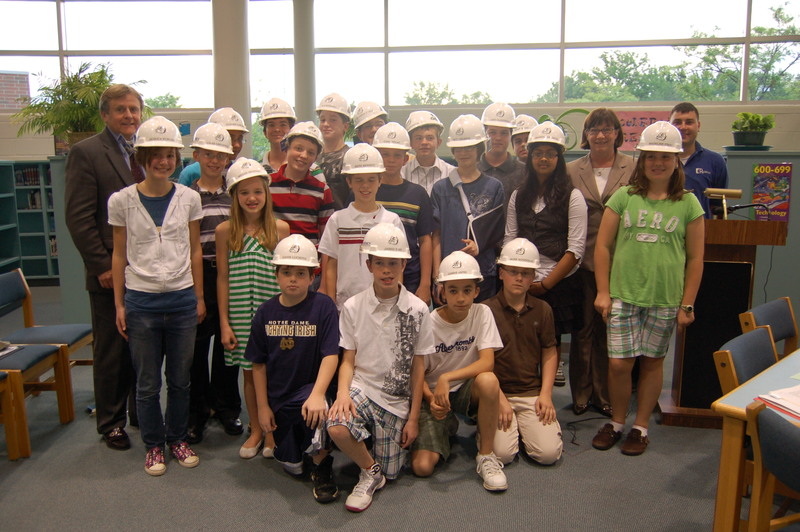 For additional photos from the “Green Team” Club’s Tree Planting Ceremony on May 21st, click here. Following the formal dedication speech, "Green Team" Club members lined up to each place soil over the trees roots. 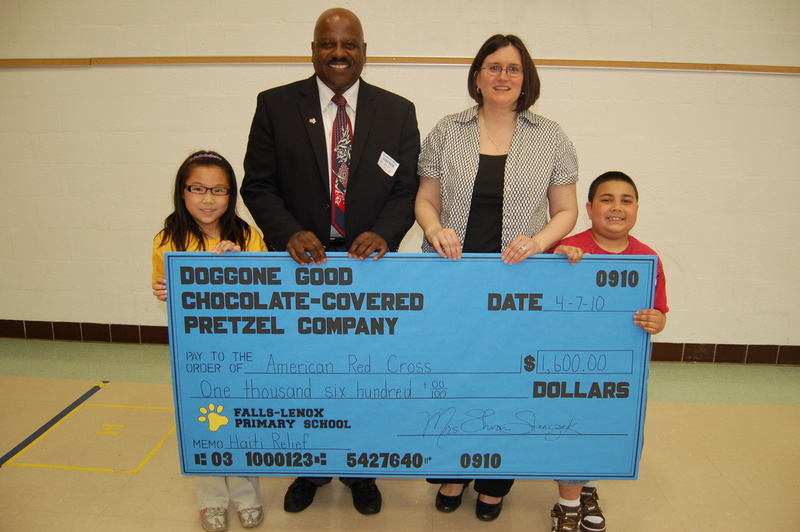 Mr. Baker from the American Red Cross of Greater Cleveland accepts a check presented by Mrs. Stanczak and students from the "Doggone Good Chocolate Covered Pretzel Company" project at Falls-Lenox. Mr. Torrance Baker, Senior Manager for Major Gifts for the American Red Cross of Greater Cleveland, attended a special check presentation at Falls-Lenox on Friday, May 21st. Third grade students, who participated in “The Doggone Good Chocolate Covered Pretzel Company” project this spring, provided Mr. Baker with a special Power Point over-viewing their project – which raised $1,600 for Red Cross earthquake relief efforts in Haiti. The event concluded with the formal presentation of the check, and a special punch and cookies reception. An important decision was made last evening by our Board of Education during a scheduled Work Session. After spending considerable time reviewing the District’s 5 year financial forecast and discussing multiple variables that will likely effect the District’s finances, a discussion occurred again on the topic of high school busing. As you know, at the April 15th Board meeting, the Board of Education voted 3-2 to delay the reimplementation of HS busing. However, last night, another vote was called for and, by a 3-2 vote, a decision was made by the Board of Education to re-instate high school busing service for the upcoming 2010-2011 school year. Great trepidation still exists with both the Board and Administration regarding what the future holds for our District in terms of State funding cuts. However, there is a strong desire by the Board and Administration to ensure that the commitments made during the levy campaign (click here to review) are followed to the best of the District’s ability. As a school system, we serve many different customers. We are, at times, faced with decisions that make one set of customers happy, while making another set of customers upset. The decision regarding whether to restore high school busing under this continuing condition of economic uncertainty is a perfect example of such a decision. While many of our high school parents will be pleased by the reimplementation of this transportation service, there will, at the same time, be residents without children in school who will not understand this expenditure during these economic times. While it is true that the state foundation formula assists school districts defray the cost of transportation services, the current amount of money received by OFCS from “the state” would neither increase, nor decrease, by implementing (or not implementing) high school busing. In essence, the financial ramifications on implementing high school busing fall solely on the taxpayers of this community. I am pleased by the Board’s decision and must express my great respect for the care and consideration each member gave to their final vote. 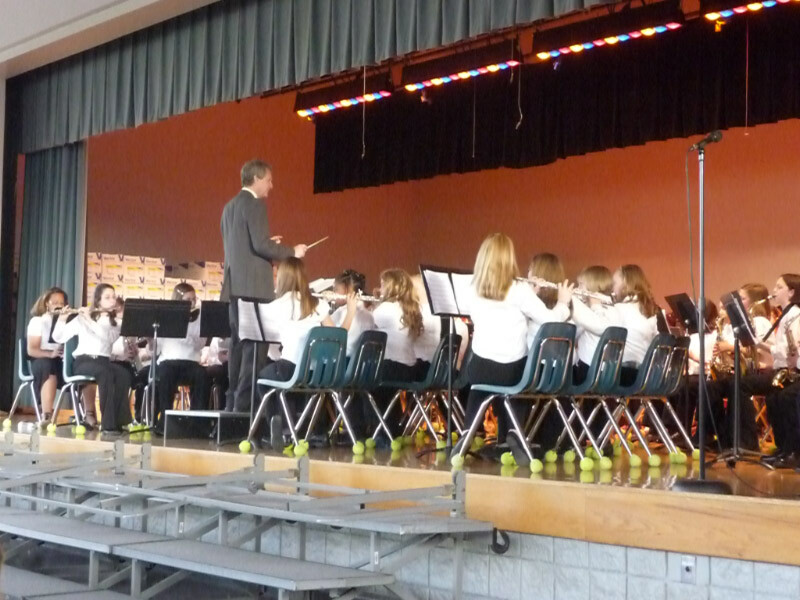 For the fourth consecutive year, Olmsted Falls School District has been named one of the “Best Communities for Music Education in America” by a national survey sponsored by the National Association of Music Merchants (NAMM) Foundation. The school districts named by the NAMM Foundation this year demonstrate an unwavering commitment to providing music education for their students – even during these challenging economic times. This year’s roster represents schools and school districts in 30 states, including 15 in Ohio. Click here to download an informational flyer about tomorrow night’s meeting. Click here for additional information about the Orientation Meeting for current 3rd grade students and their parents scheduled for this Monday, May 17th at 7:00 p.m. in the Olmsted Falls Intermediate School (OFIS) cafeteria. 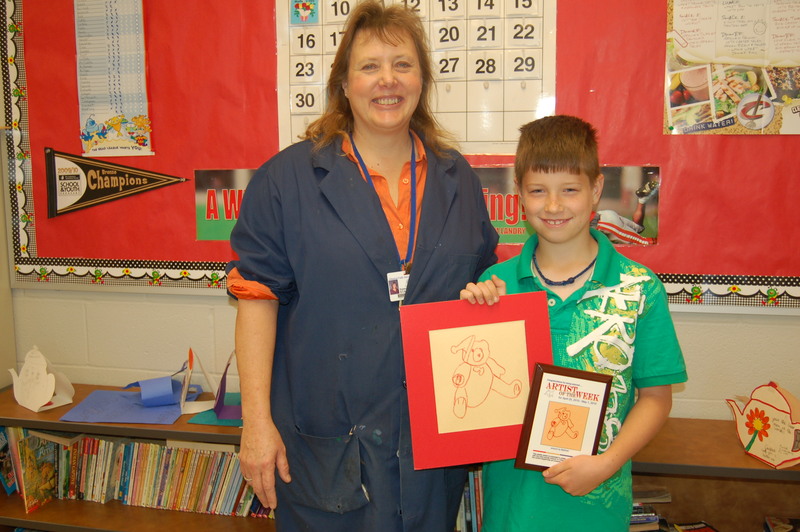 OFIS art teacher Mrs. Magnone with Artsonia Artist of the Week winner Matthew McFadden. Congratulations to 4th grader Matthew McFadden on being named Artsonia “Artist of the Week Contest” for his winning contour line drawing of a stuffed bear. Matthew received a plaque featuring his award-winning art and a $50 gift certificate from BLICK art materials. Matthew’s win also earned a $100 BLICK gift certificate for his school, Olmsted Falls Intermediate. Artsonia is an on-line art museum featuring the largest collection of student artwork in the world. Art teachers at both Falls-Lenox and OFIS regularly upload student artwork into individual on-line galleries. OFHS mathematics teachers, Ms. Donna Langenderfer and Mr. Jeff VanArnhem, have each been selected to attend prestigious summer educator programs to increase their knowledge and skills relating to classroom technology. OFHS math teacher Mr. Jeff VanArnhem will attend the 2010 Texas Instruments Leadership Training program in Dallas, Texas. 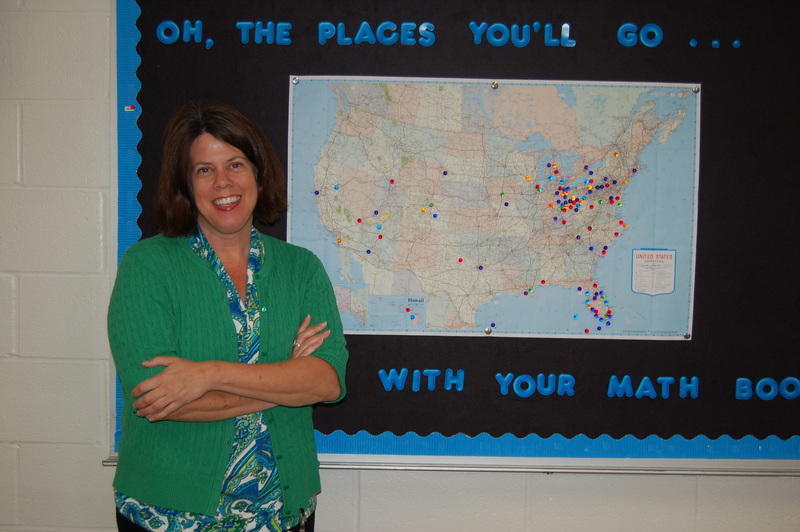 OFHS math teacher Ms. Donna Langenderfer will attend the SMART Exemplary Educator Summit in Calgary, Alberta, Canada. Ms. Langenderfer is one of just 50 educators selected to attend the week-long SMART Exemplary Educator Summit taking place this summer at SMART Technologies (maker of the SMART Board) corporate headquarters in Calgary, Alberta, Canada. Ms. Langenderfer was selected from a pool of applicants for being a proven technology leader who has consistently demonstrated innovative use of SMART products to improve education outcomes in her classroom. All expenses for Ms. Langenderfer’s trip and training in Calgary are being paid by SMART Technologies. Congratulations on this outstanding opportunity! Mr. VanArnhem has been invited to attend the 2010 Texas Instruments Leadership training program in Dallas, Texas. The 5-day, all-expense-paid workshop will explore a variety of topics relating to enhancing the classroom envirnoment through the use of technology. Mr. VanArnhem was nominated to attend this workshop becasue of leadership qualities and technology skills he demonstrated during a past professional development workshop. Congratulations! 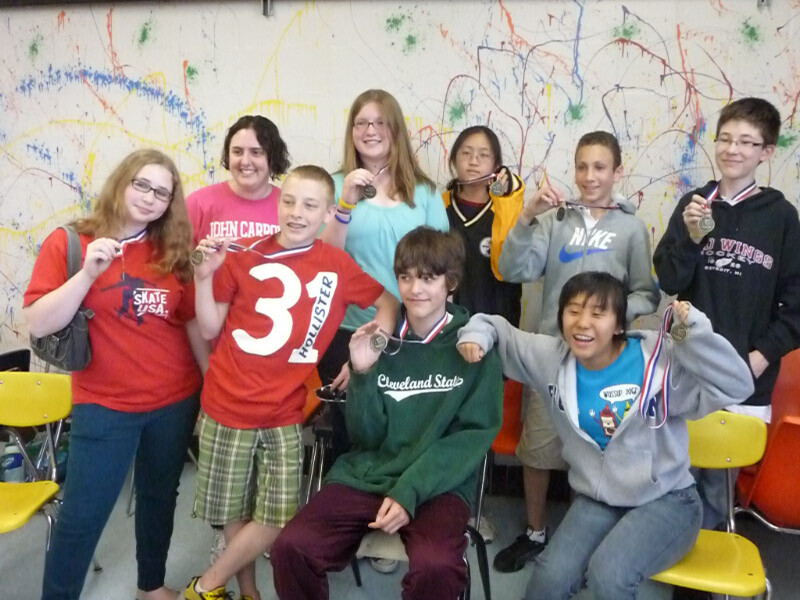 7th and 8th graders show off their medals following the GCCTM Math Contest on May 1st. Front row (L to R): Katherine Grega, David Lance, Dan McFadden and Julie Wu. Back Row (L to R): Mrs. Miskimins, Cecelia Dahlinger, Adelin Leung, Yahia Ali and David Graham. Students from Olmsted Falls Middle School competed in the Greater Cleveland Council for Teachers of Mathematics (GCCTM) Math Contest held May 1st (for 7th & 8th graders) and May 8th (for 6th graders) in Berea. Students worked in teams of three on four themed problem solving events during the contest: “Six Places to Start,” “Mental Math,” “Hurdles” and “The Pile.” Performance in each event was scored by a group of volunteers, including teachers from the visiting schools. Congratulations to our 7th and 8th grade students (pictured at right) who each earned a medal by scoring in the top 20% at the competition. Congratulations as well to our 6th grade student participants who also each earned medals for scoring in the top 20% at the competition. Sixth grade team members included: Zach Buchta, Morgan Ashton, Claire Barratt, Jennifer Bertrand, Jake Conder, Logan Petruziello, Stephen Miller, and Chandler Laird. Great job by all! 2010 Boys Summer Basketball Camp (for grades 3-8) – June 21st – 24th – Registration Deadline: May 21st. Click here for additional information and registration form. 2010 Girls Summer Basketball Camp (for grades 4-9) – June 14th – 17th – Registration Deadline: May 21st. Click here for additional information and registration form. 13th Annual OFHS Baseball Camp (for grades 4-9) – June 14th – 18th – Registration Deadline: May 28th. Click here for additional information and registration form. The 18th Annual 4 Man Scramble Golf Championship to benefit the Olmsted Falls High School Hockey program is scheduled for Saturday, August 7th at Pine Brook Golf Club in Grafton. 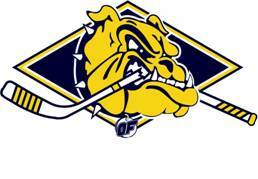 This fundraiser helps Olmsted Falls High School hockey players and their families pay for ice time to practice. Click here for additional information on this upcoming golf outing. The American Red Cross has gratefully acknowledged Olmsted Falls High School for sponsoring an American Red Cross blood drive on April 30, 2010. The American Red Cross was able to collect a total of 56 pints of blood for needed patient care. Of the 74 presenting donors, 23 donated blood for the first time with the American Red Cross. A considerable amount of work goes into every blood drive and precious lives have been saved or sustained as a direct result of the dedicated support of our OFHS students and staff. This year Olmsted High School has earned $1,000 in scholarship fund donations from the American Red Cross for their efforts! 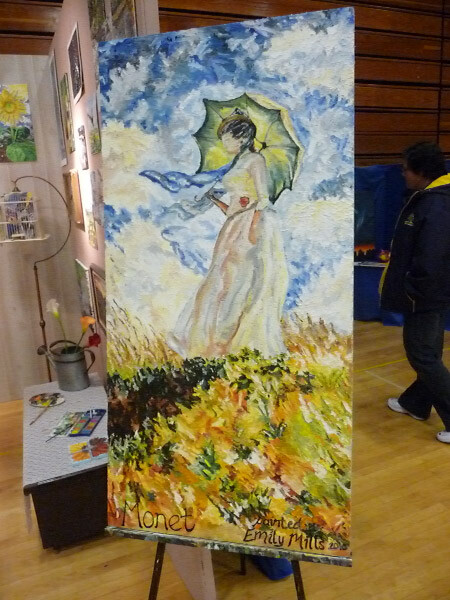 Student artwork on display at Annual May Show. 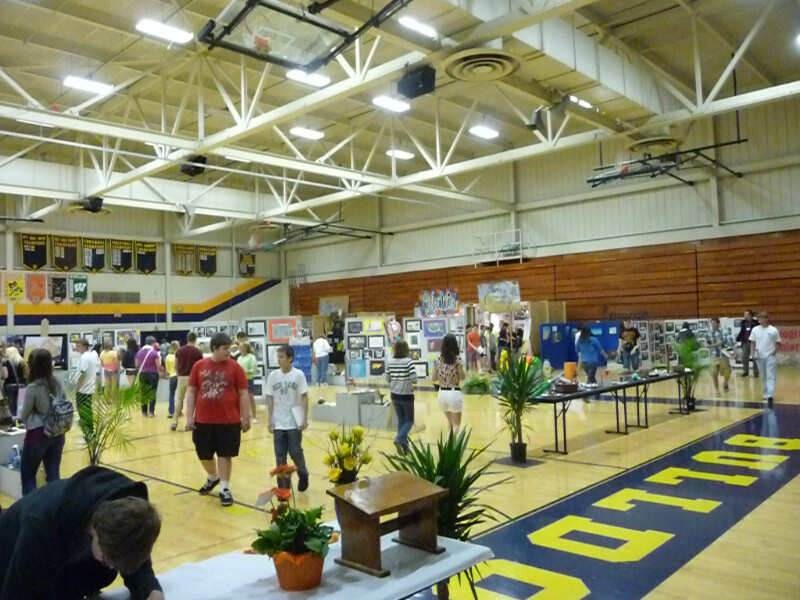 Students, parents, staff and residents attended the Annual May Show held at OFHS on May 8th. 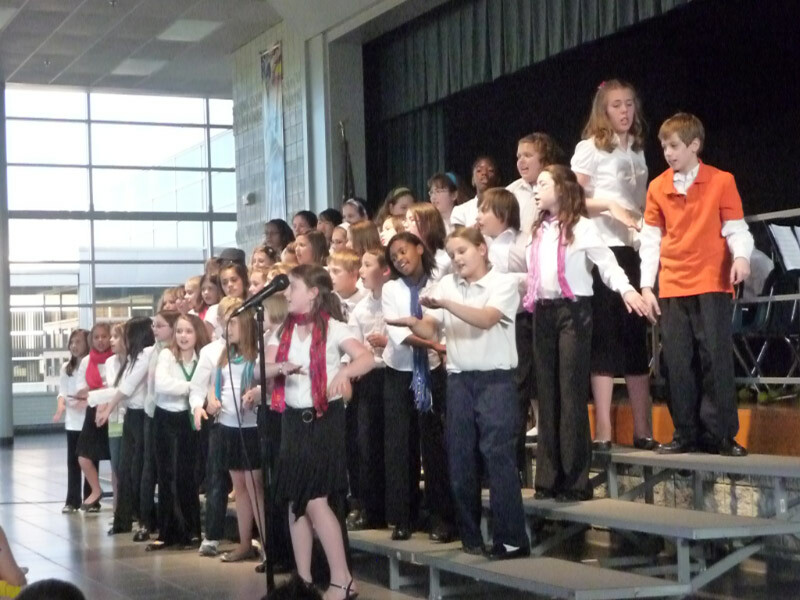 4th and 5th grade singers perform during OFIS Spring Concert event. 5th grade band students perfrom during OFIS Spring Concert.